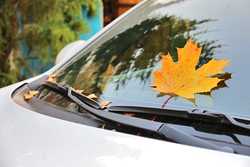 October is Fall Car Care Month, so Amica Insurance is sharing tips to improve the safety and performance of your vehicle. With winter right around the corner, now is a good time to prepare your car for the colder weather and tougher driving conditions. Check tire pressure and tread, and also look for bulges and bald spots. Uneven wear to the tires means it’s time for a wheel alignment. Make sure the lights and windshield wipers work properly. Check both the interior and exterior lighting, and replace worn wiper blades to improve visibility during precipitation. Have the brake system checked annually, and make sure brake linings, rotors and drums are inspected during every oil change. Check the battery, hoses and belts. Make sure the battery connection is clean, tight and corrosion-free. For hoses, make sure they are not cracked, brittle, frayed, loose or showing signs of excessive wear. Top off all fluids, including engine oil, power steering, brake and transmission fluid, as well as windshield washer solvent and antifreeze/coolant. Amica Mutual Insurance Co., the nation’s oldest mutual insurer of automobiles, was founded in 1907. The company, based in Lincoln, Rhode Island, is a national writer of auto, home, marine and umbrella insurance. Life coverage is available through Amica Life Insurance Company, a wholly owned subsidiary. Amica employs more than 3,500 people in 44 offices across the country. For more information, visit Amica.com.